This is an image of glassomer, which can be milled, laser-machined or processed in CNC machines just like a conventional polymer. Image: Markus Breig, KIT. Pure quartz glass is highly transparent and resistant to thermal, physical and chemical impacts, which is why it’s ideal for use in optics, data technology or medical engineering. For efficient, high-quality machining, however, adequate processes for working with glass have been lacking. 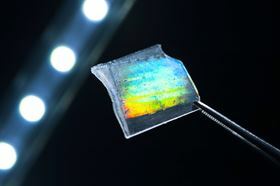 Now, scientists at the Karlsruhe Institute of Technology (KIT) in Germany have developed a processing technology that can structure quartz glass like a polymer. The scientists report their innovation in a paper in Advanced Materials. "It has always been a big challenge to combine highly pure quartz glass and its excellent properties with a simple structuring technology," says Bastian Rapp, head of the NeptunLab interdisciplinary research group in KIT's Institute of Microstructure Technology (IMT). Rapp and his team develop new processes for industrial glass processing. "Instead of heating glass up to 800°C for forming or structuring parts of glass blocks by laser processing or etching, we start with the smallest glass particles," he explains. Rapp’s group mix glass particles 40nm in size with a liquid polymer, shape the mix like a sponge cake and then harden it to a solid by exposing it to heat or light. The resulting materials consists of glass particles in a polymer matrix at a ratio of 60 to 40 percent by volume. The polymers act like a bonding agent, fixing the glass particles at the right locations and thus maintaining a defined shape. The resultant ‘glassomer’ can be milled, laser-machined or processed in CNC machines just like a conventional polymer. "The entire range of polymer forming technologies is now opened for glass," Rapp says. To fabricate high-performance lenses that are used in smartphones and other devices, for example, the scientists first cut them from a glassomer rod. The polymers in the composite then have to be removed, which is done by heating the lenses in a furnace at 500–600°C. This burns away the polymer, fully converting it to CO2. To close the resulting gaps in the material, the lenses are sintered at 1300°C, which transforms the remaining glass particles into pore-free glass. The processing technology allows highly pure glass materials to be produced for applications that have previously required polymers. This opens up new opportunities for the glass processing industry, as well as for the optical industry, microelectronics, biotechnology and medical engineering. "Our process is suited for mass production. Production and use of quartz glass are much cheaper, more sustainable and more energy-efficient than those of a special polymer," Rapp says. This is the third innovation in the processing of quartz glass to be developed by NeptunLab using a liquid glass-polymer mixture. In 2016, the scientists succeeded in using this mixture for molding, while in 2017 they applied the mixture for 3D printing and demonstrated its suitability for additive manufacture. A spinoff company now plans to commercialize the glassomer. This story is adapted from material from KIT, with editorial changes made by Materials Today. The views expressed in this article do not necessarily represent those of Elsevier. Link to original source.